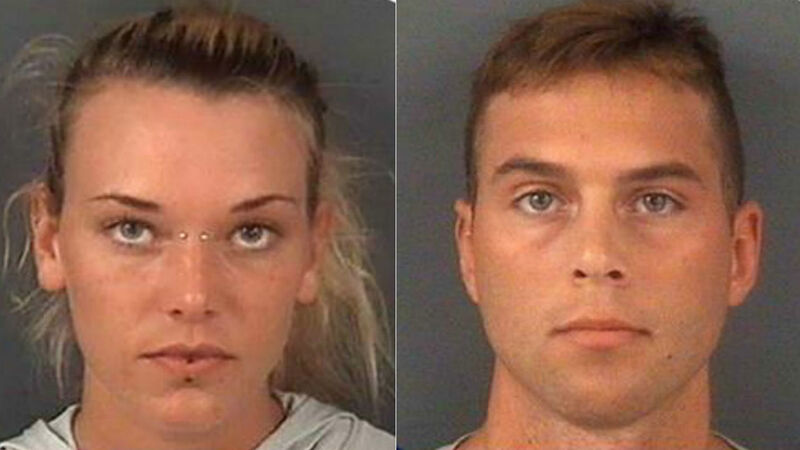 FAYETTEVILLE, North Carolina -- A former soldier and her boyfriend face felony charges of animal cruelty and conspiracy after a video surfaced that appeared to show the pair tying her dog to a tree and shooting him numerous times with a rifle while laughing. Marinna Rollins, 23, was taken into custody Tuesday. Her boyfriend, Jerren Heng, 26, was already in custody, according to the Cumberland County Sheriff's Office. This photo submitted to ABC11 allegedly shows Cumboui tied to a tree moments before he was shot nearly a dozen times with a rifle. He then shot the dog five times in rapid succession, an act also seen on the video. According to the report and the video, Rollins then dragged the dog to a shallow grave and spoke to him. In the video, which was obtained by sister station ABC11, a female voice can be heard talking to the dog shortly before she lifted his limp body and placed him in the grave, then draped a white sheet over him. "It's been real ... I love you, you're my puppy, you're a good puppy, but...," the female voice says to the pup in the video. ABC7 is not showing the video because of the graphic nature of the content. "Kind of put him a little deeper in there," a man's voice can be heard saying as Rollins pushes the dog into the shallow grave. Police said that before shooting her dog, Rollins posted a photo of her dog on her Facebook page along with text that she "was sad that her dog had to go to a happier place." Police also said she sent text messages confessing to shooting her dog. Rollins and Heng, both of the 5600 block of Netherfield Place in Fayetteville are being held at the Cumberland County Jail. Rollins is being held on $25,000 bond. Heng's bond is now also $25,000. He had a court appearance Tuesday.